Being acquainted with the blogsphere has changed me in more ways than one. For one, it kept me company when I'm stuck at home (how pathetic!). It has opened my eyes into a world I never knew existed or let's say I never knew was of this great magnitude. A virtual world exists here with real people, unselfishly sharing their life experiences. More than anything else, travel blogs have caught my attention. Reading these blogs makes me want to travel more than the usual. Traveling with great company has become my passion. As the designated organizer of the group, I handle all the headaches of planning a trip and the harder part of pooling in the right mix of travelers. 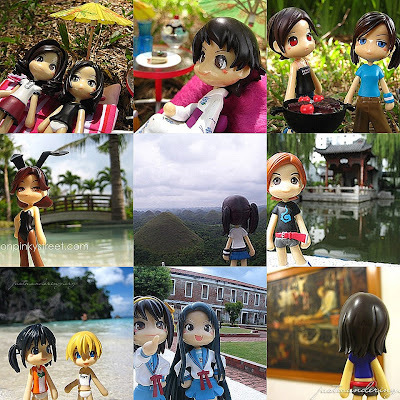 Blogging got me acquainted with travel forums like virtualtourist and pex. Aside from that are real traveler's travel blogs like Anton, Tutubi and those in my blog roll. I also came across a couple of budget tour organizers like Owen's Diy Philippines and Travel Factor, that makes traveling more affordable and hassle free. I shall join them in the coming months. Hopefully I'll get a goodnight's rest during the trip unlike in the previous trips I've organized. One more is having a travel mascot or as they aptly call as travel gnome. A travel mascot is a toy, a prop or anything that you bring around while you travel and perhaps take a portrait of them. Apparently not only Charlie Brown brings his blanket wherever he goes. My first attempt to travel with a travel mascot was four months ago. I named her Tokidoki simply it's from Le Sportsac's Tokidoki collection. I have to take shots candidly so that I won't draw strange glances from the people around me. I still have to overcome that shyness of doing it. it's not that easy actually, I still ought to learn which angle works best. When i went to Hawai'i, I hung out with a guy who took pictures of his stuffed animal at various sites like Manoa Falls. I thought that was weird, but I guess other people also do that kind of stuff as shown by those gnomes. hi tin, thanks for dropping a line. hehe tumaas na to 48 to a dollar!